Teesha Klein with the wristbands that she is using to raise funds to buy wheelchairs and transport chairs for the use of patients at the Cross Cancer Institute. There are six more wheelchairs and transport chairs available for use by patients at the Cross Cancer Institute in Edmonton because Teesha Klein wants to give back. She raised the funds for the chairs through the use of bracelets for donations. It all began last spring when her boyfriend, Brad, was diagnosed with Hodgkin's Lymphoma and spent 32 days as a patient in the Cross Cancer Institute. While he was there, the care he received was so amazingly good that Teesha was tremendously impressed, but even more amazing was the way the staff also looked out for her and made sure that all her needs were met. Seeing the way the first class medical care was given with such thoughtful kindness and concern for the whole person, she wanted to give back. 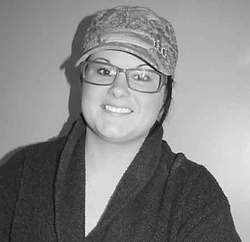 Teesha's inquiries led her to the Alberta Cancer Foundation and its representative serving the Cross Cancer Institute, Chelsey Neil. From Neil, she learned that one of the greatest needs was Wheelchairs and Transport Chairs which give the patients a greater degree of mobility while they are in the Cross Cancer Institute. Already excited about providing more chairs, Teesha experienced their importance when Brad was well enough for her to take him outside in a Wheelchair. She also learned that the chairs are the items most often stolen from the Cross Cancer Institute. Teesha's inquiries also included an on-line search for fund raising ideas, and she chose to go with a company in the U.S.A. that sells bracelets and puts 10% of their sales into Hodgkin's Lymphoma research in the U.S.A. The wristbands are in the shade of pink used for cancer ribbons, are stretchy, and have the words "HOPE, FAITH, LOVE" impressed into them with a ribbon symbol impressed between the words. Teesha's donation to her project is the cost of the bracelets and her time and effort to get donations and contributions and to forward them to the Alberta Cancer Foundation. Every cent that others contribute goes directly into an open account with the Alberta Cancer Foundation for the stated use. Because Teesha wants to know exactly how the funds she raises are being used, she really appreciates Chelsey Neil, her discussion of needs and options, and their ongoing communication. She showed me the letter from Neil acknowledging receipt of the funds for the first six Wheelchairs and Transport Chairs, and assuring her that the funds were indeed used for them. Teesha's goal is to raise funds for another six Wheelchairs and Transport Chairs and for an ice machine for the use of volunteers taking cold drinks such as juice and cold water to the patients and their families. She welcomes all contributions, but gives out a wristband for a donation of $5 or more. She works as a hairdresser at Permanentz at 4802C – 50th Ave. in Wetaskiwin, and can accept contributions there. Because she was so impressed with the patient care at the Cross Cancer Institute, impressed by the concern that the patient and family not worry about anything, impressed by the huge difference this quality of care makes for the patient and family, Teesha Klein asks for consideration of donating to her project for Patient Care through the Alberta Cancer Foundation. She says, "All of us will be faced with cancer in some sort of way, a family member, a friend, or ourselves and I believe with faith, prayer, and the kindness and support of the Cross Cancer Institute, anything is possible."